The brand new Regent Street flagship of Pepe Jeans has officially opened its doors. Located at 59-61 in the heart of London’s prestigious shopping strip, the new 1500sq ft shop offers the label’s complete womenswear, menswear, denim range, accessories as well as footwear across a single floor. The unit it has moved into were formally occupied by Hawes & Curtis and Excellence of London, two separate stores which were modified into a single one. “This store represents a new chapter for the Pepe Jeans brand,” Pepe Jeans chief marketing officer Mark Blenkinsop said in a statement. “London was the birthplace for the brand, and so it’s only right that we enhanced the brand’s visibility in the capital. The new flagship was designed by design firm Martin Brudniziki and is the first in Pepe Jeans’ estate to use the concept. “From a brand presentation perspective, our objective for Regent Street was not just to open a new store, the objective was to deliver an innovative retail experience,” Blenkinsop said. 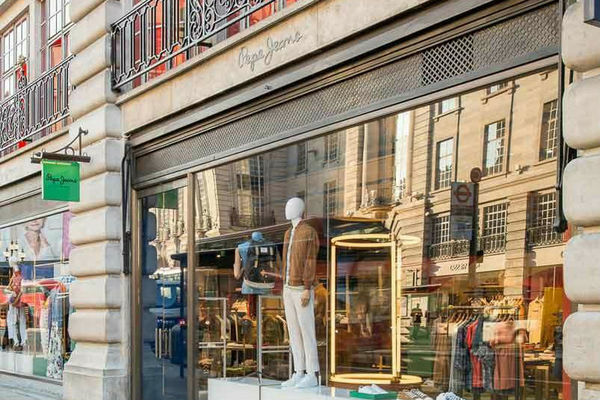 Pepe Jeans is also the latest in a string of fashion brands to open on Regent Street, with Tory Burch, Coach, Stuart Weitzman, Kate Spade, Michael Kors and Polo Ralph Lauren all opening stores there in the past year.